For some time, I saw Gene Logsdon as a wiry bearded fellow in slouch hat and knee boots, striding purposefully across a field he was sowing by hand. That was the picture at the top of his stationary, a piece of line art called “The Country Rover,” who was also broadcasting words across a page, or that was how I saw it. This, of course, gives you some idea of how long I’ve known him: how long has it been since people actually used stationery and wrote letters to one another? So for several years our friendship grew by those ancient instruments, the telephone and the typewriter, and by the antecedents we had in common. We were both farm boys, and we’d had too many heretical questions for our respective religions — his Catholic, mine Baptist — to put up with either of us, and so we’d been set out in the contemporary wilderness. We were both writers, too, branded — yet again — by a lean toward people and sensibilities usually found to be somewhat out-of-favor. Before long, Gene was not just the country rover; he’d become — his name — “the contrary farmer.” And his wilderness turned out to be a small piece of ancestral farmland south of Toledo where he and his wife, Carol, began a life in sustainable farming. It was all entirely in keeping with his nature as recusant, and his joy at flouting most of the prescribed orthodoxies around him, both secular and ecclesiastical. After Gene had been seriously ill for the first time, he even gained an affection for chickweed, a noxious plant that is normally the bane of gardeners everywhere. Gene, though, decided that he was dealing with a form of eternal life, or as he said, “another version of my bewilderment about life everlasting.” When he learned that someone had made a salve out of chickweed that was good for rashes and abrasions, he mused that if he smeared enough on himself, he might live forever. That reminded me of the first time I met Gene in person. By this time I was an editor at Ohio magazine, and another editor and I drove up from Columbus to his farm to discuss article ideas. He actually looked like The Country Rover, minus the beard but hearty and trim. He’d just come from helping one of his ewes who’d gotten her head stuck in a fence, merely one of the many odd problems that crop perpetually up to test the resilience of the small landholder. A sheep is an intransigent creature, Gene explained, and would mule forward until she died, never thinking to back herself out. Gene solved the problem by holding a handful of fresh sheep manure under her nose, and the ewe promptly reversed herself and backed out of the fence. “You’ll forgive me for not shaking hands,” I said, also backing up. And we laughed. When you were around Gene, you were always laughing. We also laughed at the picture of the other editor, a striking woman with an East Coast pedigree wearing expensive boots who walked across one of Gene’s pastures as though it were a minefield. Even she found it amusing. “How does one get safely from place to place out here?” she asked Gene. “Oh, we look at these as little beacons that give us direction,” Gene said. In 2007, he included me in an essay in his book, The Mother of All Arts, a chronicle of his friendships with creative types who had agrarian backgrounds. I wasn’t sure I was, indeed, an agrarian writer, but I was pleased to be there, right beside Michael Perry, one of our favorite writers. Until I read Gene’s overly generous essay there, I had forgotten that, early on, when Gene was working for Robert Rodale and his publications, he’d tried to get me into print there. What followed was a humorous exercise in editorial whimsy. As Gene reported, Mr. Rodale didn’t know what to make of the essay I wrote for Gene on crime in the countryside, and so he had it critiqued by a sociologist, an obviously sober man who was disappointed that I hadn’t included any statistics on rural crime and certain I’d “demeaned the seriousness of the problem.” (The essay finally went off to Richard Ketchum at Country Journal who immediately bought it, even bereft of statistics.) Gene, though the rejection was no fault of his, was contrite, and all he could offer me by way of solace was an anecdote about Mr. Rodale. Rodale was a man of enthusiasms, Gene said, and while some of them were lasting (as were his contributions to the organic farm movement), others were of briefer duration. One summer, for instance, there was a pronouncement in his offices to the effect that tight jockey shorts were unhealthy, and he encouraged his employees to, in effect, loosen up. One day, as Gene recalled it, a very loose Mr. Rodale was working, standing up, one foot on his desk, when he accidentally slammed a desk drawer on his tender hanging parts. In a few days, a small notice appeared on the office bulletin board, rescinding any previous instructions about underwear. This wasn’t reported in Gene’s essay, because he admired Mr. Rodale, and while it was a wonderful story, he’d save it for his friends in conversation, understanding full well that — like my editor picking her way across Gene’s pasture — life was always one small gesture from unintended consequences. Lords was a book of great spirit (pun intended), but Gene was just getting warmed up for what I think is his best book — Pope Mary and the Church of Almighty Good Food. It was a cross between P.G. Wodehouse and William Dean Howells, a kind of fable containing everything Gene believed about people, agriculture, and the church. It featured a sheep-herding priest and an iconoclastic woman farmer, and when Rome decided to close their church, the venerable old St. Philodendra, a cast of wonderful irregulars emerged from the parish closet, unleashing anarchy in all directions. Behind the satire is an ultimate richness that goes to the heart of Gene’s beliefs: the idea of converting empty ritual into a genuinely spiritual subsistence — the Host made literal, you might say. That notion arises so nicely that when the reader finally sees what Gene is up to, he/she is perfectly taken in, sitting expectantly at the Communion table as if it might have a platter of fried chicken on it. “Well, it was just a matter of time until you got your two lifelong topics — religion and agriculture — under the same roof and thoroughly dealt with them,” I wrote him. By the small connections Gene made between himself and every part of the varied life all around him, he had become — my term, for he would have disputed me — holy. He was kind, generous, cheerful, ribaldly humorous, and unceasingly productive. He was a sweet man. I didn’t see him often, but he was often in my presence. I thought of him as an exemplar for the well-lived life, and when I read Henry James’s quote about being “one of the people on whom nothing is lost,” I thought first of Gene. Wesley Jackson, president of The Land Institute, said that Gene was one of only three people he knew who was able to make a living out of writing exclusively what should be common sense. 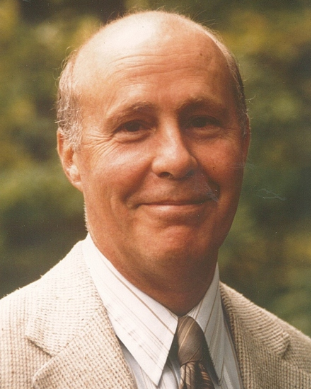 Verlyn Klinkenborg in The New York Times said he was “the best — and most plain-spoken — philosopher of rural living I know.” And while Gene was not the first advocate for a personal, sustainable agriculture, he became its modern statesman. When he returned to his family’s land back in the 1970s, that kind of agriculture was a curiosity. Today, in my county alone, we probably have a dozen thriving small-practice farmsteads. It was surely providence that the publisher of Gene Everlasting was committed to ecological stewardship, using recycled paper and vegetable inks. Even as Gene was leaving us, Chelsea Green’s production values were lending him a kind of eternal life, or what passed for it in publishing circles. Writing, after all, can be a kind of immortality, and in one of my last — unsuspecting! — letters to him, I teased him about my discovery of “the cloud,” whereby my Orange Frazer publishing office was now storing its manuscripts on off-site servers by way of the internet. The notion amused him. “Who would have thought that an old Luddite such as myself might be delivered by technology?” he said. Gene, however, had been delivered long before. It was when he and Carol returned to the farmland owned by his maternal kin, the Ralls, who once had owned sixteen farms outside of Upper Sandusky, fourteen of them contiguous. The town was five miles away, Gene said, and as a boy he could walk to town and never leave Rall land except for one short span. There, on his own small piece of land, he found the sublimity he couldn’t find in church. The rituals he and Carol observed didn’t seem to be that different, either, requiring, as they did, a similar and difficult faith. He’d connected himself to similar verities, equally eternal, of which he reminded us in the wonderfully serene concluding passage to Gene Everlasting. In the days since his death, reading his books, I keep returning to that final chapter, in which he rejoiced in the spring of his remission, uncertain whether he’d have another. I loved that last scene, hearing his good voice as I’d always heard it and recalling his vast constancy, as writer, farmer, family man, and friend. And I thought: What else is immortality? Next articleWho Are Public Monuments For? John Baskin is the author of New Burlington: The Life and Death of an American Village and a collection of essays, In Praise of Practical Fertilizer. He’s the founding editor of the Midwestern publishing company, Orange Frazer Press, Inc., and is completing a new book, The Superfluous Man: An Improbable Story of the Good War.